When searching for a siding contractor in Lake Bluff IL, trust Siding & Windows Group for all your siding and exterior remodeling needs. Whether you need new or replacement siding, your windows replaced, gutters or a professional siding contractor, we can suite your needs and budget with Siding & Windows Group. We are the professional siding contractor in Lake Bluff that has the reputation, experience, and skills needed to make sure your siding project is finished in the way that exceeds your expectations, on-time and within budget. Aat Siding & Windows Group, we want to help you in getting your replacement windows or siding project completed on time and under budget. We take pride in offering not only affordable work but a high quality product and installation, so you can be proud of your home’s new look. The above photo is of a siding project we completed near Lake Bluff. 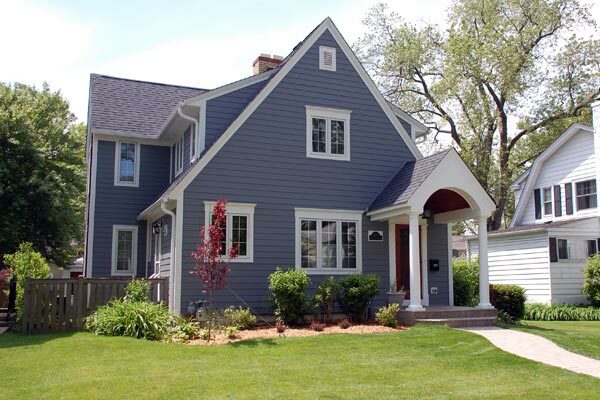 Siding & Windows Group has performed many professional siding jobs in Lake Bluff and the surrounding Chicagoland areas, and we often recommend using James Hardie fiber-cement siding. Browse about this and other Lake Bluff siding projects. Siding & Windows Group is recognized as a leader in Lake Bluff for originality, innovation, and architectural integrity for exterior design. Our siding installation projects have helped us win multiple awards through out the years, while our high standard of customer service and quality installation maintain it for years to come. We are committed to offering the best customer service possible; this is why most of our business is from referrals. Call us for a free siding estimate, and we’ll come out to your home and listen to your needs and ideas. We’ll answer any questions you have and walk you through the entire siding process. You have complete control in the remodeling process; after all, it is your home. You tell us the type of windows you want replaced, or the siding choice, and we’ll do it right – the first time! That’s how siding contractors in Lake Bluff should be! So, if you’re looking for a window or siding contractor in Lake Bluff, contact Siding & Windows Group today, and let us show you why we’re the leading Lake Bluff siding contractor!